2008 and on the ways of responding to them. The highest priority for Ukraine in 2008 is to implement the critical legal and regulatory reforms necessary to increase the size of economy, promote domestic and international investment, create tens of thousands of new jobs, build the private wealth creation capacity, and integrate Ukraine into the world business and economic system. Moving Ukraine forward in the next few years means moving the economy forward. The recent accession to the World Trade Organization (WTO) is a major step forward but only one of the many steps needed for Ukraine to continue building an independent, strong, prosperous, democratic nation for its citizens and taking its rightful place in the community of nations. The United States-Ukraine Business Council (USUBC), since it was founded in 1995 in Washington D.C., has worked to support the development of Ukraine’s private business sector and especially Ukraine’s WTO bid. The USUBC looks forward to Ukraine’s WTO membership as a major benefit not only for companies already doing business in Ukraine but also as a strong attraction for additional domestic and international direct investments. We congratulate Ukraine on this major achievement. On January 31 of this year, Ukraine’s Vice Prime Minister Hryhoriy Nemyrya, addressed over 75 USUBC members and guests at a meeting in Kyiv. This was Nemyrya’s debut presentation before any business organization since becoming a leading player in the new government. Nemyrya is one of a group of well-educated and reform-minded ministers who have become the vital center of the new Tymoshenko government. Educated both in Ukraine and the United States, Nemyrya has in his short tenure led the negotiations that solved an impasse with the European Commission over WTO accession issues related to Ukraine’s penchant for export duties. As Nemyrya pointed out at the January 31 USUBC meeting, WTO accession is just a precursor to the next and perhaps even more important trade measure for Ukraine, the negotiation of a Ukraine-EU Free Trade Agreement. Nemyrya said that preparations had already been made for the beginning of negotiations. He cautioned USUBC members that negotiation of the free trade agreement is likely to take a minimum of at least two years but that Ukraine must begin the process now. USUBC member companies appreciate the positive actions the new government has already made and believe the serious and effective implementation of the TTI and the “Contract with Investors” would allow the business community to expand their operations and investments in Ukraine. The international business community is very optimistic about Ukraine’s future. This is evident in the fact USUBC has been able to triple its membership in the past 18 months. Working with business industry, NGO and government leaders, USUBC has become the largest private business membership organization that focuses on Ukraine, organized outside Ukraine. The USUBC is now a strong voice, working together with other business organizations, for the implementation of reforms in Ukraine that will allow the domestic and international business community to expand. The partial solution of the VAT refund issue is a recent example of private business organizations and the two governments working together. The failure of previous governments to tackle the VAT refund problem had allowed government indebtedness to balloon to well over one billion Ukrainian hryvnya (UAH), long overdue to companies with export operations in Ukraine. The figures ranged from a few million UAH for some companies to one major exporter that reportedly owed over $100 million. VAT refund failure had crippled some company operations to the point that investment decisions favorable to Ukraine had been delayed and in some cases abandoned. Within a matter of weeks after the Yulia Tymoshenko government took office, the prime minister and minister of finance announced at a January 24 meeting with the business community in Kyiv that a new round of refunds would be made soon. Just as important, there was an announcement that the process would be operated very transparently and the practice of giving refunds first to those who would accept heavily discounted payments or engaged in corruption would be abandoned. Within a matter of days several USUBC members reported they had received settlements that were as high as 80 million UAH in one case. If the government now follows through and operates the VAT refund program in compliance with international standards, they will have gone a long way towards solving one of the business communities’ major problems. Every Ukrainian government since 1999 has made promises and then failed to follow-up with the actions needed to resolve a small claim that could have allowed the U.S. government’s Overseas Private Investment Corporation (OPIC) to provide hundreds of millions of dollars in political risk insurance, loan guarantees and investment funds. This is one of the greatest missed opportunities since Ukraine’s independence and needs to be solved now. Government actions for the past two years to severely restrict the export of agricultural commodities have cost Ukraine hundreds of millions of dollars. These unnecessary controls need to be removed. Private markets should be allowed to work for the benefit of Ukraine. Land privatization, particularly agricultural land, is a critical area. Certainly, some safeguards must be adopted but this thorny problem can and must be solved. As Ukraine approaches Euro–2012, the greatest travel and tourism opportunity in its history, bringing the country’s air safety law up to international standards is essential. Additional huge investments in infrastructure must be planned and implementation started in 2008. If Ukraine is to become a true partner in international trade, then it must deal honestly and effectively with intellectual property rights. This includes the whole spectrum in the IT area, genetics (seeds, etc), crop protection supplies and pharmaceuticals. The National Bank of Ukraine is widely regarded as having some of the most restrictive and least reformed procedures of any central bank in the former Soviet Union. Serious regulatory reform is essential for business, industry and private interests. The government’s notorious Regulation 31 and other barriers to private energy development must be reformed as a precursor to any serious effort toward attracting the major energy exploration investments that are needed if Ukraine makes progress toward energy independence. The Ukrainian customs service is considered one of the most inefficient and corrupt parts of the entire government structure and must undergo top to bottom reform. A modern, internationally accepted law on joint stock companies needs to be passed by the Parliament. Much of Ukraine’s business and civil code is largely unchanged from Soviet times and requires urgent reformation. Corporate raidership and other legal issues are a huge problem since the legal and court system does not work effectively and is subject to corruption. Massive government reorganization must take place to improve the capacity to plan, make decisions and implement actions needed for reform. Inflation is too high and is a terrible burden. Inflation must be brought under control through means other than direct and indirect government price controls. Increased foreign direct investments, and the privatization of more government assets are needed for economic stability. In reciting the successes and challenges, USUBC expresses its gratitude to the U.S. Ambassador to Ukraine, William B. Taylor, Jr., and the U.S. Embassy staff for their outstanding work to support an improved private business environment. Work by the business sector, in cooperation with the governments of Ukraine and the United States, must continue and produce real results to move Ukraine’s economic growth forward. Assisting in the development of Ukraine’s private economic and business system is USUBC’s number one priority. 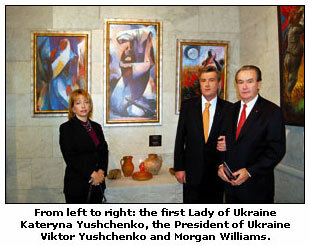 Morgan Williams has worked on issues related to the economic development of Ukraine since 1993; he is Director, Government Affairs, Washington Office, SigmaBleyzer Private Equity Investment Group and serves as President of the U.S.-Ukraine Business Council (USUBC).